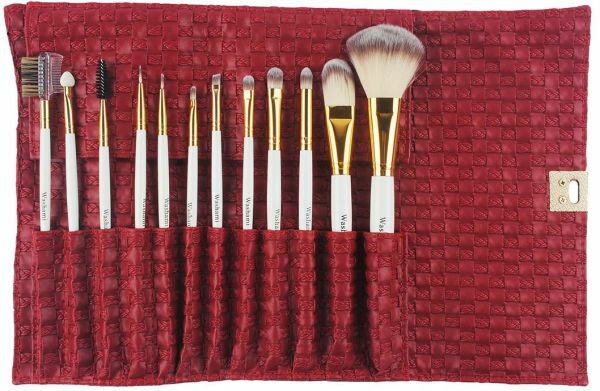 Total 12 Brushes for Facial Makeup adopts natural pure goat hair which provides superb ability to hold powder, soft and pleasing for your skin. These Brushes range from every size to fit doing makeup for every different parts on face, so that you can perfect a makeup easily and effectively. Total 12 Brushes for Facial Makeup adopts natural pure goat hair which provides superb ability to hold powder, soft and pleasing for your skin. These Brushes range from every size to fit doing makeup for every different parts on face, so that you can perfect a makeup easily and effectively. Gorgeous quality bag, easy to collect and carry brushes. An essential for not only professionals but also domestic users.